Editor’s Note: This article was prepared from materials provided for the press conferences at RSNA 2012, held November 25 to 30 in Chicago. Study finds that about one-half of people who have CT scans know radiologists are doctors. 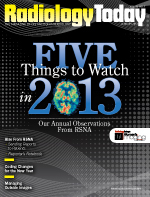 New research presented at RSNA 2012 shows that even patients who’ve had imaging exams in the past know little about the profession of radiology. Researchers said the study findings highlight an opportunity for radiologists to educate the public about their role in healthcare. The roots of the new study trace back to a speech by the late Gary Glazer, MD, former chair of the department of radiology at Stanford University School of Medicine in California. Miller and colleagues focused on patients undergoing outpatient CT at the university hospital. During a four-month period, they asked adult patients if they would be willing to meet with a radiologist and complete two brief surveys concerning radiologists and their role in healthcare. Of the 307 patients surveyed, almost one-half had at least a college education or higher. Slightly more than 64% of respondents reported that they had little or no idea what radiologists do. Only 35.8% reported having much understanding, despite the fact that almost 83% replied it is important or very important to know who interprets their imaging exams. Overall experience was reported as very positive by 70% of those who met a radiologist vs. 53% of those who did not meet a radiologist. Slightly more than 83% of respondents said they were interested or very interested in receiving a copy of their radiology report. Only 2.7% were not interested. More than 62% expressed interest in having access to a website with their radiologists’ biographies and pictures. Radiologists from Canada presented findings at RSNA 2012 that have begun to identify a pattern of injuries that may be indicative of elder abuse. Murphy conducted a literature review and searched databases for elder abuse cases to locate radiologic evidence of the types of injuries found in abuse victims over the age of 60. An analysis of more than 1,100 cases revealed that the most frequent injuries among the abused elderly were facial trauma, dental trauma, subdural hematoma, eye and larynx trauma, rib fractures, and upper extremity injuries. New MRI research has found that some mountain climbers who experience high-altitude sickness have traces of bleeding in the brain years after the initial incident. High-altitude cerebral edema (HACE) is a severe and often fatal condition that can affect mountain climbers, hikers, skiers, and travelers at high altitudes, typically above 7,000 feet (2,300 meters). HACE results from brain tissue swelling due to fluid leakage from the capillaries. Symptoms include headache, loss of coordination, and decreasing levels of consciousness. Knauth and colleagues at the University Hospitals in Goettingen and Heidelberg, Germany, compared brain MRI findings among four groups of mountaineers: climbers with well-documented episodes of HACE, climbers with a history of high-altitude illness, climbers with a history of severe acute mountain sickness, and climbers with a history of isolated high-altitude pulmonary edema, a life-threatening accumulation of fluid in the lungs that occurs at high altitudes. The MRI results showed brain microhemorrhages almost exclusively in HACE survivors. Of the 10 climbers with a history of HACE, eight had evidence of microhemorrhages on an MRI. The other two had uncertain results. Only two of the remaining 26 climbers were positive for microhemorrhages. Survivors of the most clinically severe cases of HACE had the most prominent evidence of microhemorrhages on an MRI. The microbleeds were found predominantly in the corpus callosum, the thick band of nerve fibers that connects the right and left halves of the brain, and showed a characteristic distribution different from other vascular diseases, such as vasculitis. Too much and too little physical activity can accelerate the degeneration of knee cartilage in middle-aged adults, according to a new study presented at RSNA 2012. Nearly one in two people in the United States may develop knee osteoarthritis by the age of 85, according to the Centers for Disease Control and Prevention. By 2030, an estimated 67 million Americans over the age of 18 are projected to have physician-diagnosed arthritis. Researchers at the University of California in San Francisco (UCSF) previously had found an association between physical activity and cartilage degeneration, but that study focused on one point in time. In a new study at UCSF, researchers looked at changes in knee cartilage among a group of middle-aged adults over a four-year period. They used MRI-based T2 relaxation times to track the evolution of early degenerative cartilage changes in the knee. The researchers analyzed 205 patients aged 45 to 60 from the UCSF-based Osteoarthritis Initiative, a nationwide study funded by the National Institutes of Health on the prevention and treatment of knee osteoarthritis. Participants used a questionnaire to record their physical activity. The researchers measured T2 values of cartilage at the patella, femur, and tibia of the right knee joint at baseline and at two- and four-year visits. Blacks have a higher risk of coronary artery disease (CAD) than whites, yet they have much less fat around their hearts compared with whites, according to research presented at RSNA 2012. The counterintuitive finding suggests research is needed to investigate potential racial differences. According to the Centers for Disease Control and Prevention, coronary heart disease is the leading cause of death for people of most ethnicities in the United States. In 2010, the age-adjusted prevalence of coronary heart disease was 6.5% among blacks compared with 5.8% among whites. “We were very interested in finding an explanation for the racial difference in CAD and suspected differences in thoracic adipose tissue between races might be one of the contributing factors,” said Paul Apfaltrer, MD, of the Institute of Clinical Radiology and Nuclear Medicine at the University Medical Center Mannheim, Heidelberg University in Germany. For the study, researchers evaluated cardiac dual-source CT images of 411 age- and gender-matched black and white patients, quantifying thoracic fat volumes, including epicardial adipose tissue (body fat that is in direct contact with the heart) and mediastinal adipose tissue (body fat within the chest cavity). Results showed that while the prevalence of significant stenosis (narrowing of the coronary ducts) and plaque was similar in black and white patients, black patients had less fat around their hearts. According to Schoepf and Apfaltrer, the findings are surprising given the higher number of cardiac and metabolic disorders among blacks despite the presence of less fat in the chest cavity. The researchers suggested that epicardial adipose tissue may act as a protective buffer or that it may be related to plaque maturation, including calcification, and could contribute to a lower risk of acute coronary events. The pattern of gray matter loss is significantly different in male and female Alzheimer’s patients, according to a study presented at RSNA 2012. In the study, Spampinato and colleagues analyzed data on 109 patients, 60 men and 49 women (mean age of 77), who participated in the Alzheimer’s Disease Neuroimaging Initiative, a major study that followed hundreds of cognitively healthy individuals, individuals with mild cognitive impairment (MCI), and individuals who had Alzheimer’s disease over a period of five years. During the five-year period, each of the 109 patients progressed from amnestic MCI, in which the patient suffers memory loss but maintains cognitive function, to Alzheimer’s disease. Using MR images of the patients’ brains taken when they were diagnosed with Alzheimer’s disease and 12 months before and after the diagnosis, the researchers created brain maps that illustrated gray matter changes. These maps revealed that compared with male patients, the women had greater atrophy in gray matter 12 months prior to their Alzheimer’s disease diagnosis and at the time of their diagnosis. The brain maps also showed that the men and women in the study lost gray matter volume in different areas of the brain as their disease progressed from MCI to Alzheimer’s disease.